Kamehameha Statue: One of the Most Photographed Attractions in Honolulu. 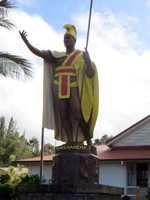 The King Kamehameha Statue Welcomes All! (Kah-may-ha-may-ha). 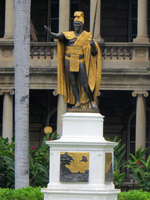 Granted… when you get right down to it, the King Kamehameha statue is little more than a motionless monument cast in bronze. 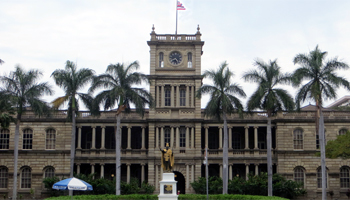 Nevertheless, this 5.5-meter (18-foot) likeness, which stands outside the beautiful and historic Aliiolani Hale (Ah-lee-ee-oh-la-nee Ha-lay) Hawaii Supreme Court building, is one of the most photographed of all Hawaii attractions. You’ll see it in every episode of Hawaii FIVE-0. You’ll see it if you visit any of the nearby Oahu Hawaii activities such as Iolani Palace, Hawaii State Art Museum, the Hawaii State Capitol, and/or Kawaiahao Church. You can see its shipwrecked then recovered predecessor on the Big Island of Hawaii. 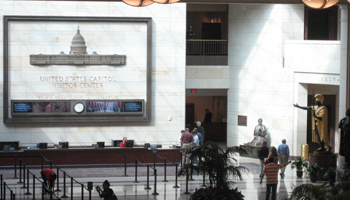 And you can see its replica if you ever go to the U.S. Capitol Visitor Center in Washington DC. One Hawaiian divination said that the sign of the great king’s coming would be a comet. Thus, when Kamehameha’s birth in 1758 coincided with the passing of Haley’s Comet, it seemed as if his fate was written in the stars. Meanwhile, another tale prophesied that the king who overturned the 3,000+ kg (7,000 pounds) Naha Stone at the Temple Pinao in Hilo would basically be unstoppable – the greatest king in Hawaii history! In this literary epic, which rivals Arthur’s sword in the stone, Kamehameha proved he was that great king with one mighty demonstration of his right to rule! 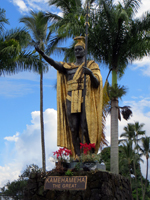 Regardless of what you believe about the king’s legendary rise to power, it’s historical fact that King Kamehameha was the first king to unite the Hawaiian Islands under one rule. Through military prowess, diplomatic skill, and apparent manifest destiny, Kamehameha the Great created an era of peace and stability when it was needed most – at the time when Hawaii was being discovered by European explorers. Without a strong, centralized monarchy, the individual chiefdoms of Hawaii could have been susceptible to Western colonization, which might have changed Hawaii history in ways nobody can predict. 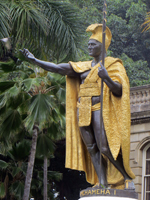 Sculpted by Thomas Ridgeway Gould (link opens a new window/tab) in 1883, the King Kamehameha statue in Honolulu, is a replacement for the originally-commissioned statue, which was lost at sea off the tip of South America. That original statue was found and recovered by Falkland Islanders before the replacement statue was completed. Thus, it was then erected near Kamehameha’s birthplace in North Kohala on the Big Island of Hawaii; and Gould’s substitute statue was dedicated in Honolulu. The third replica was commissioned in honor of Hawaii statehood, and it stands in the U.S. Capitol since 1969. 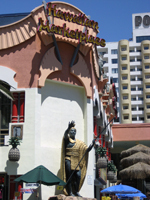 Beyond that, I’ve seen similar statues on the Las Vegas strip (big surprise there, right?) and in Hilo on the Big Island. I’ve heard that there is another replica statue at the Grand Wailea Resort Hotel and Spa on Maui, but I don’t recall that I’ve ever been to that hotel, so I’ve probably never seen it. 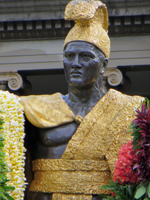 The very best time to view the King Kamehameha statue is on King Kamehameha Day, June 11, and immediately thereafter. That’s when they drape the statue with long strands of flower lei. As far as I know, similar ceremonies are also held at the statues on the Big Island and at the nation’s capitol (but having never been at either of those locations on June 11th, I can’t promise that information is accurate). However, this page is about the statue in Honolulu, and I know from seeing it myself that the tradition holds true here on Oahu. 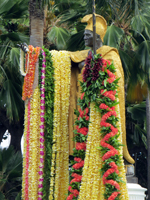 One way or the other – lei or no lei – you’re sure to get some good pictures with a great king. And that’s what counts for your Hawaii vacation.